TUCSON, Ariz. - Safety on the roads does not always relate to reckless drivers and rough roads. 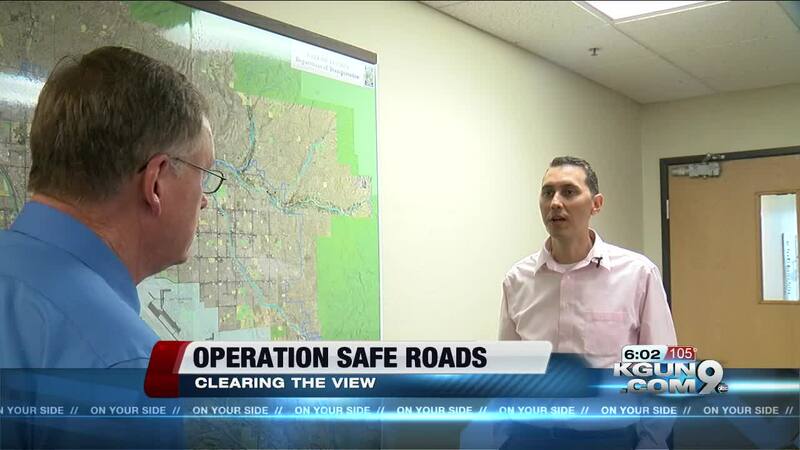 KGUN9's Operation Safe Roads looks a lot of things that can affect your safety. Sometimes danger can sprout from the side of the road. A KGUN9 viewer asked us to check out how hard it can be to safely cross Country Club from a road called Elvira. She told us thick desert plants make it hard to see oncoming traffic. Since it's in the industrial zone near the airport, drivers can easily pull right in front of a truck. Tami Thomas is a different driver who told us, oh yeah---it's scary. "The plants are all overgrown and it's hard to see past them and cars are going fifty or sixty miles per hour and you have to kind of nudge out a little bit. It's kind of a pain and it's dangerous." Tucson DOT says it takes safety hazards like this seriously . TDOT assigned a supervisor to examine the site and put it on a list to be handled in no longer than 24 hours. The department depends of people calling in any trouble they see. TDOT Interim Deputy Director Sam Credio says, "This time of year we have the monsoon season and there's a lot of vegetation growing all over the place but also storm debris. If someone notices a tree branch is down please call it in. We want to know that. We want to get out there, get it out of the way, make sure the right of way is safe for the public." That goes for potholes too but TDOT says it's very important to describe the location as precisely as you can and give them a way to contact you if they have any questions. For emergency traffic safety matters call 911. If you want to tell TDOT about a street hazard you can email at TDOTConcerns@Tucsonaz.gov. You can also call (520) 791-3154 from 8am to 5pm Monday through Friday. After normal working hours or on weekends call (520) 791-4144.